Step in a floor only. Photo courtesy of Kyle Siefers. … or you be trippin. Sign maker, you put your foot in your mouth! A step in the head is better than a grab in the puss. 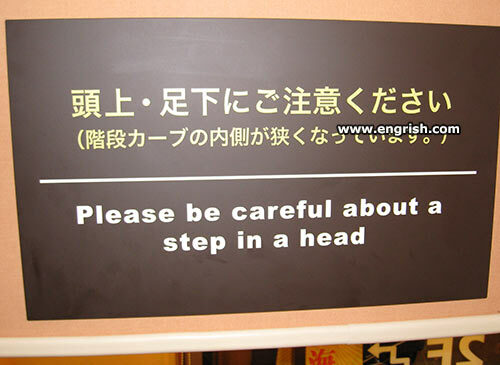 Safety start in a head. A step in a head is sure to draw some stares. Two Old Danish brothers in Cairns had a fishing boat. They found that they could make more money from chartering their boat out to fishing parties, than commercial fishing. That night one of the brothers said to the other: “Ve cannot take these wimmens out, ve do not haf a pisshous. So armed with an English Dictionary, and a fair degree of Danish stupidity, they drafted an announcement. In a boat or a ship. The Head is where the toilets are. A step in the head will get water in your sea-boots. Too many steps in the head will make your nose run. – Darling? I hear a step in my head. – Don’t worry. I see an Engrish in the sky! Tsk, tsk, we lose more heads that way. Chuck Norris must be near. Learn to quit while you are still ahead. A foot in the head, would require superlative deep-throat technique. Because we don’t always have the chance to clean up right away if somebody fails to aim properly. I always make a point of being sure my shoelaces are securely tied and not brushing against the floor before going to the head, because who ever washes shoelaces?